The notion that cognition comprises more than computations of a central nervous system operating on representations has gained a foothold in human cognitive science for a few decades now. Various brands of embodied, extended, enacted, and distributed cognition, some more conservative and some more liberal, have paraded in philosophy and cognitive science. I call the genus including all such species situated cognition and go on to depict selected cases in nonhuman comparative cognition. Distributed cognition is often used as another term for situated cognition. But behavioral biologists have used the term in another sense, to mean the reduction of cognitive capacities arising from team work in cooperative societies. Hymenopteran insects have been studied as cases. The octopus displays embodied cognition, with some of the computational work offloaded to the periphery. Web-building spiders showcase extended cognition, in which objects external to the animal—the web, in the case of spiders—play a crucial causal role in cognition. A criterion of mutual manipulability, in which causal influence flows both ways between organism and extended object, serves to delimit the scope of extended cognition. Play in dogs features intelligence on-the-run, arising out of action, a key characteristic of enactive cognition. I discuss other cases in which action entwines with central representational cognition to achieve goal-directed behavior. Considering situated cognition in diverse animals leads to myriad research questions that can enrich the field. Author Note: Ken Cheng, Department of Biological Sciences, Macquarie University, Sydney, NSW 2109 Australia. Correspondence concerning this article should be addressed to Ken Cheng at ken.cheng@mq.edu.au. Acknowledgments: I thank John Sutton, David Kaplan, Marcia Spetch, and three anonymous reviewers for comments on earlier drafts of this article. Here. It’s all right here in my noodle. The rest is just ­scribbling. Scribbling and bibbling, bibbling and scribbling. In a line from the movie Amadeus (Zaentz & Forman, 1984) the gist of which is memorable to me, Wolfgang Amadeus Mozart indicated that an entire composition resided in his brain and that the rest was clearly subordinate to centralized cognition. This view of centralized cognition still dominates cognitive science in general and comparative cognition in particular. In this view of Cartesian cognition, the ratiocinations of the brain, typically cast as operating on a consortium of representations the nature of which is argued over, are placed on the throne. The rest of the supporting cast of the emotions, the body, and the environment is given the measly connotations of scribbling and bibbling. But recent calls can be heard to extend comparative cognition and situate it beyond the central operations of the brain, following some two decades of such rumblings in human cognition. This article explores some selected cases of situated cognition in nonhuman animals. Thoughts on this topic arose from writing a reference book on animal thinking for the popular audience (Cheng, 2016). Interesting cases across a range of animal taxa have now accumulated on how bodily parts outside the brain, external objects, and action work with the brain in cognition. My views here are more formative than definitive, with this article being more a showcase to start a dialogue than a position statement. The idea that cognition reaches beyond the brain started with the term distributed cognition (Michaelian & Sutton, 2013), and although that term is still used, I am sticking to another common term, situated cognition. This term serves at a genus level, referring to the general class encompassing cognition beyond the brain of a single animal. The term distributed cognition, on the other hand, now takes on a different sense at the species level, in which cognition is spread among different animals. Eusocial insects, especially hymenopterans, provide case studies here. If the cognition required for different tasks is spread among different animals, each can be less brainy in both cognitive and anatomical senses. A second species of situated cognition features cognition devolved to parts of the body other than the central nervous system; this variety is most commonly called embodied cognition. Although the term often reaches its tentacles to incorporate the environment and objects in the environment, I stick with the use of body parts in cognition. Another variety, extended cognition (Clark & Chalmers, 1998), refers to cognition encompassing physical objects in the world, often objects constructed by the animal. The spider’s web features in a well-defined case (Japyassú & Laland, 2017). In a social variety of extended cognition, cognition can be extended to other social agents, including what they create (Gallagher, 2013). Finally, I use the term enactive cognition to refer to a position in which action is at the heart of cognition, dragging brain, body, and the environment into the cognitive realm (Merritt, 2015a, 2015b). Our familiar best friend Canis familiaris will take center stage in this segment. The genus of situated cognition comes in conservative and liberal versions (Merritt, 2015b; Michaelian & Sutton, 2013). In the conservative versions, the extension adds a component to standard cognitive theory based on representations and operations over representations, a component outside of the central nervous system. Thus, nervous control embodied in the arms of an octopus or extended to the web of an orb-web spider adds such a component to standard cognitive theory. The liberal versions recast cognition as something fundamentally different from the standard cognition of representations. For example, to Gallagher (2013), cognition in humans arises from a socially extended mind, “constituted not only in social interactions with others, but also in ways that involve institutional structures, norms, and practices” (p. 4). In this liberal view, not only bodies and objects but also entire historical institutions such as the law or scientific paradigms of research make up cognition. Merritt’s (2015a) ideas about dog cognition stem from a radical liberal perspective taking on stage action, including coordinated action between individual animals. As might be expected, such views are not without their critics, and I end with some critical discussion. Although I am contrasting situated cognition to a view called Cartesian cognition, the latter is a modern caricature of René Descartes. Descartes is known as a rationalist philosopher championing dualism, the separation of mind and body. The father of modern philosophy, however, was also a mathematician and natural scientist, and perhaps a forerunner of embodied and extended cognition. In Optics, Descartes (1985) wrote of a blind man’s walking stick allowing him to see the environment, that the “stick is the organ of some sixth sense” (p. 153). And I am indebted to John Sutton for pointing out that in a letter to Mersenne in April 1640, Descartes (1991) wrote that “a lute player … has a part of his memory in his hands: for the ease of positioning and bending his fingers in various ways” (p. 146). In the same letter, he wrote of “local memory” (quotation marks in the original) outside of us, for example, as found in a book. Descartes the rationalist might have foreshadowed Clark and Chalmers (1998) more than three and a half centuries earlier. Distributed cognition in the species sense means that cognition required for tasks is split among different individuals so that each individual can cognize less, and perhaps function on smaller nervous systems, saving metabolic costs. Recent cases examining hymenopterans focused on brains rather than the analysis of cognitive requirements of tasks (Kamhi, Gronenberg, Robson, & Traniello, 2016; O’Donnell et al., 2015) and provided mixed evidence. O’Donnell and colleagues (2015) focused on 29 species of wasps, including both solitary and social species. The authors measured the relative sizes of mushroom body calyces in these species. The mushroom bodies form a key processing center in insect brains (Giurfa, 2003; Menzel, 2001). O’Donnell et al.’s distributed cognition hypothesis predicts that the more social species would have smaller mushroom body calyces. Their hypothesis was confirmed only in part. Mushroom bodies were smaller in social species than in solitary species. But among the social species, the degree of sociality was not related systematically to mushroom-body size. Kamhi et al. (2016) compared two species of ants of different social complexity (all ant species are eusocial): the highly complex Australian weaver ant Oecophylla smaragdina and the socially basic Formica subsericia. In relative mushroom body size, Kamhi et al. found the opposite of the predictions of the distributed cognition hypothesis: O. smaragdina had if anything bigger mushroom bodies. But they also found that O. smaragdina compensated for the costs of bigger brains to an extent by having metabolically less energetic nervous systems. The distributed cognition hypothesis (O’Donnell et al., 2015) is opposite to the social brain hypothesis as applied to, for example, primates (Dunbar, 1998). The social brain hypothesis predicts that brain size—in particular, neocortex size—increases with the social complexity of the species. The distributed cognition hypothesis, as applied to eusocial species, predicts the opposite: Brains can be smaller in theory because nest mates form a cooperative team with common interests and can divide up tasks. Social primates remain very much individuals, in competition with one another for resources and reproductive opportunities, with this competition supposedly driving cortical size. The social brain hypothesis has been much criticized for neglecting other factors that drive brain evolution (Reader, Hager, & Laland, 2011) and other parts of the brain than the neocortex that have evolved in mosaic fashion in the primate line (de Winter & Oxnard, 2001; lay summary: Cheng, 2016, Chapter 17). The distributed cognition hypothesis has so far been examined only in brain anatomy, as I do not know of work systematically comparing behavior as a function of level of sociality in eusocial insects. However the hypothesis fares, it remains conservative. In fact, all it posits is a bit less of standard cognition in individual eusocial animals because they share tasks with teammates. But the hypothesis can turn liberal if we reconceive an entire nest or hive as an organism. Queller (2000) argued that highly eusocial insect colonies, such as honeybees, operate as a whole with minimal conflict much like the cells of multicellular organisms. Although conflict between colony members is not zero, neither is conflict within the body of a multicellular animal—think of autoimmune diseases, for example. If we take the cells of a multicellular animal to make up an organism, the parallel argument can be made for the individuals of a honeybee hive, a termite mound, or an ant nest, so argued Queller, who would call them organisms and not use the makeshift term superorganism. When we cast an entire hive as a cognizing unit, we hit the liberal front in situated cognition. I do not know of any current literature arguing this way. Embodied Cognition in Cephalopods: Multiple Brains? The common cuttlefish (Sepia officinalis) and the common octopus (Octopus vulgaris) are much studied coleoid cephalopods of the phylum Mollusca, the branch of cephalopods tagged as “live fast, die young” (Grasso & Basil, 2009), evolving to compete in the demanding world of teleost fishes. Cuttlefish and octopuses display a wide range of learning (Darmaillacq, Jozet-Alves, Bellanger, & Dickel, 2014; Darmaillacq, Lesimple, & Dickel, 2008; Grasso & Basil, 2009; Shomrat, Turchetti-Maia, Stern-Mentch, Basil, & Hochner, 2015) and navigational prowess (Alves, Boal, & Dickel, 2008; Mather, 1991). In two cases, the multifaceted camouflage in S. officinalis and arm movements in O. vulgaris, substantial parts of the job are thought to be devolved to peripheral nervous systems in the body outside of the brain. These constitute embodied cognition in a literal sense: Some cognitive control takes place in the body, outside of the central brain. The anatomy of coleoid nervous systems displays a clue for embodied cognition, with the octopus perhaps the best studied model. Much of the octopus’s nervous system lies outside the central brain. Hochner (2013) gave an estimate of half a billion neurons in the entire nervous system. Of the neuronal population, some 50 million reside in the central brain, connected with two big optic lobes each with about 60 million neurons. An estimated 320 million dwell in the arms, about 40 million in each arm. Although the central brain is, of course, connected to the peripheral nervous system, the connecting fibers are few in comparison to the number of neurons, more than two orders of magnitude fewer. One possible case of embodied cognition is camouflage in the cuttlefish (Chiao, Chubb, & Hanlon, 2015). The camouflage is based on neural control, as the various organs that don the disguises—chromatophores, leucophores, and iridophores—are packed with muscles that contract to fan out or relax to shut down their colorful displays (Hanlon & Messenger, 1988). With millions of organs organized into tens of units, the degrees of freedom to control look daunting. Chiao et al. (2015) suggested that central control is vastly reduced because all camouflage in cuttlefish comes in three flavors, each with further wrinkles (literally and metaphorically speaking): uniform, mottle, or disruptive (Figure 1). Action selection might consist mainly of choosing one of the three major patterns, with perhaps a few other degrees of freedom to settle on for controlling how wrinkled the skin looks and how the arms are oriented. Lower levels, still in the central brain, take care of details. Many variables, not discussed here, determine which of the three major types of camouflage is displayed so that we have a funneling in at the input end. The central brain might have only a few major switches to operate, a manageably low number of degrees of freedom. Our understanding of the neural control of chromatophores, leucophores, and iridophores—the workhorses in engineering cephalopod camouflage—is currently murky. One exciting recent discovery, however, raises the intriguing prospect of local neural control at the skin: machinery for making photosensitive molecules (Kingston, Kuzirian, Hanlon, & Cronin, 2015). Transcripts that encode rhodopsin and retinochrome have been found in the chromatophores of several species of cuttlefish. These suggest photoreceptive capacities in the skin. Leaping ahead—and here I leap further than Kingston et al.—it is conceivable that photomuscular loops in the skin help to control or modulate details of camouflage. This would make a small amount of embodied cognition in cuttlefish camouflage. Such ideas, however, remain currently speculative, lacking any firm support. In octopus, control over its eight arms presents challenges. Unlike marine arthropods with their hard exteriors, such as crabs and lobsters, or teleost fishes with their hard internal bones, the octopus is soft bodied, inspiring the field of soft robotics (Pfeifer, Iida, & Lungarella, 2014; Shen, 2016). Its arms can bend anywhere along their length, with only one fixed point of reference where they emerge from the body. With suction cups along the lengths of their arms, octopuses have the freedom to grab food anywhere on the arm. In contrast, we primates almost always grab food at the distal end of our limbs, with our hands, or in a few species with tools held in the hands. Primate arms bend in only one place, at the elbow joint. The octopus has infinite degrees of freedom in bending its limbs, a gift from dispensing with both hard exo- and endoskeletons. But this gift is also a nightmare to control neurally: The limb has too many degrees of freedom. Embodied cognition is the solution to such control problems, devolutions for reducing the number of degrees of freedom to a manageable count. A chief proponent of embodied cognition in the octopus is Hochner (2012, 2013) and his lab (Figure 2). Hochner’s conception of embodied cognition in the octopus portrays the central brain, the peripheral nervous system, and the environment, schematized in Figure 2, all as contributing to embodied cognition. But the chief innovation is devolving substantial control to the periphery, the nervous system in the arms. Decentralized control plays the starring role in fetching food to the mouth. Figure 2. An illustration of embodied cognition, based on Hochner (2012). The activity of the brain in behavior is supported by the motor system and the sensory feedback that it provides, as well as the environment. Continuous dynamics rather than top-down hierarchical orders are said to characterize the behavioral system. In fetching food, the octopus basically constructs a makeshift elbow with a peripheral neural trick (Flash & Hochner, 2005). Synchronous waves of neural activity propagate from the suction cup holding the food and the base of the arm, the one fixed reference point. Where the waves meet, somewhere near the midpoint between suction cup with food and base, an elbow forms, with the muscles along both waves stiffening to make a quasi-articulated arm, to use Flash and Hochner’s (2005, p. 662) term (see their Figure 1 for illustration). The environment seems to contribute little in this case. I am indebted to David Kaplan for pointing out that the quasi-articulated arm used by the octopus to handle food illustrates excellently morphological computation (Pfeifer, Iida, & Bongard, 2005; Pfeifer et al., 2014). The shape, structure, and texture of the body take care of some of the computation that the central nervous system needs to do, facilitating the offload of computation; morphological computation might just as well be called decomputation because it mostly cuts down the need for computation (see V. C. Müller & Hoffmann, 2017, for a detailed discussion, but the term ­decomputation is my invention). For example, the way that human limbs swing like a pendulum from shoulder or hip joints reduces the computation needed to move the limbs and yields energy efficiency. In the octopus, the work of the muscles illustrates morphological computation. To simplify the computations, it is crucial to stiffen the muscles on either side of the elbow. If the muscles do not stiffen, we end up with a kink in the elbow, but the rest of the degrees of freedom remain, an overwhelming lot. The degrees of freedom are reduced from infinite to infinite minus 1, amounting to no reduction at all. The muscles supplying the needed morphological computation/decomputation are controlled by the peripheral nervous system. In this case, the peripheral nervous system shapes muscles to reduce the degrees of freedom. The arms of the octopus seem endowed with such intelligence that Grasso (2014) suggested that the octopus has a second brain in the arms. Embodied cognition in the octopus fetching food also sits firmly in the camp of conservative situated cognition. The peripheral nervous system takes over key controlling roles, but much of the cognition generated can be and has been cast in the standard mode. The system still works with input signals from the sensory systems and representations, on the basis of which motor outputs are planned and controlled. The stiffening muscles around an elbow cuts out much need to represent the arm. Thus, morphological computation/decomputation spares a load of the cognitive work. Other patterns of movement also show a conservative brand of embodied cognition. The larvae of ­Drosophila flies offload computation to peripheral control, even in directed movement such as tracking a chemical, the behavior known as chemotaxis. Basic patterns of movement are orchestrated by peripheral nerves. The larvae crawl with peristaltic movements along the length of their body, and they also turn side to side with regular oscillations (Wystrach, Lagogiannis, & Webb, 2016). The two kinds of rhythmic oscillations are not coupled. These kinds of rhythmic movements are controlled by peripheral nerves along the body, as silencing the central brain and the supoesophageal ganglia, the more central headquarters of the nervous system, does not disrupt the oscillatory movements (Berni, Pulver, Griffith, & Bate, 2012; see further details in Berni, 2015), leading Riedl and Louis (2012) to write in a commentary that crawling in Drosophila larvae is a “no-brainer” (in their title). These basic movements can be modulated to achieve goal-directed movements, for instance, toward a chemical gradient that the larva has learned to associate with food (Wystrach et al., 2016). Thus, if a right turn leads to a smaller chemical signal, a modulation to increase the size of the next left turn in the side-to-side oscillation serves to steer the larva up the gradient. Representations in the central nervous system are thought to accomplish this dial turning of the gain of the servomechanism. The dial can also be turned in the negative direction to steer the animal away from a chemical source. The chemotaxic behavior requires the central nervous system (Berni et al., 2012), as silencing it abolishes chemotaxis. Localized control links intimately with central modulation, and oscillators work intimately with the servomechanism, two of the basic units of behavior postulated by Gallistel (1980), to navigate to a goal. Among spiders, jumping spiders, the speciose family Salticidae, pops into mind as exhibiting a range of cognition (Jackson & Cross, 2011, 2013, 2015; Jackson & Nelson, 2012; Nelson & Jackson, 2012; lay summary: Cheng, 2016, Chapter 11). From the behaviors required to live as an ant mimic to tactics in hunting other spiders to discrimination abilities needed to specialize on mosquitoes, the family parades a wide range of interesting cognition. But extended cognition has been proposed for garden-variety web-building spiders. Japyassú and Laland (2017) proposed a conservative version of extended cognition with regard to the web of web builders. Their claim is that aspects of the web forms part of the cognitive system of spiders. One criticism of extended cognition of the type proposed by Clark and Chalmers (1998) is that it is bloated. The dread is that so much affects an organism’s cognition in some way that much of the world in Gaia-like fashion becomes part of the cognitive system. A child walking home by a brook sees that some rocks have been placed along a bank to stem erosion; this affects how the child thinks about the ecology of water: Does the babbling brook then become part of the child’s extended cognition? Ultraliberal views of cognition simply reject cognitive bloat as an argument against extended cognition, taking a let-it-bloat attitude. Entire social institutions, for example, could become part and parcel of cognitive systems (Gallagher, 2013). But Japyassú and Laland (2017) deflate the bloat decisively with a well-defined restrictive philosophical criterion, the mutual manipulability criterion (Kaplan, 2012). Japyassú and Laland’s (2017) extended cognition considers when objects in the world, often objects of an animal’s own making, become a part of the animal’s cognitive system. The mutual manipulability criterion trims the list. At stake is the set of entities that have constitutive relevance to a cognitive system. Sticking to physical entities for now, although mutual manipulability could apply to abstract entities as well, a physical object constitutes part of a cognitive system when causal influence flows both ways, from object to brain and from brain to object. Rephrasing Kaplan (2012), systematic manipulations of the object must affect the animal’s cognition, and changes in the animal’s cognition must affect the object, via some causal chain. Only when this two-way flow has been established can the object be considered part of the animal’s extended cognition. Necessary background conditions that support cognition are ruled out as not constituting a part of extended cognition. For example, oxygen in the air is necessary for brain and cognitive functions, but the cognitive state of an animal does not affect the oxygen content of the air. Oxygen makes a part of the causal background conditions but does not constitute a part of extended cognition. The spider’s web provides key examples for Japyassú and Laland (2017). The web-weaving spider extends its cognition in adjusting the tension of web threads (Japyassú & Laland, 2017). The tension affects attentional processes in the web builder: the tighter the threads, the smaller the disturbance needs to be to catch the builder’s attention. Thread tension thus calibrates threshold level for attention. When tight, tinier objects such as prey items are registered, satisfying the causal chain in one direction. The spider in turn adjusts its web tension based on its state. A hungrier spider tends to tighten the web, the functional reason being that when hungry, even small prey items are worth paying attention to. That establishes causal flow in the other direction to satisfy the mutual manipulability criterion. The web-building spider also extends its cognition in building the web (Japyassú & Laland, 2017). To start with, the web builder’s cognitive state affects how the web is built. Thus, spiders learn to adjust how they build their webs depending on which part of the web captures most prey (Heiling & Herberstein, 1999; Nakata, 2012). Japyassú and Laland argued for causal flow in the web-spider direction as well because in building the web, the spider relies on previously built parts in construction. For example, in weaving the spirals, interstring gaps—the distances between concentric spirals—are determined in good part by the spirals that have already been built, especially the spirals right next to the one being woven. This saves a lot of memorizing. The authors ask readers to imagine how much needs to be remembered and programmed if the spider has to go through the motions of building its web but leaves no actual physical silk threads. The path that needs to be memorized looks complex indeed. Extended cognition functions to reduce that formidable memory load. To Japyassú and Laland (2017) then, the function of extended cognition in their conservatively defined sense is to reduce cognitive and presumably attendant brain requirements. They suggested that such reduction of cognitive load is especially important for small animals, the brains of which must be small for allometric (scaling) reasons alone. In line with a key theme of this article, they called for more comparative studies of extended cognition. In pointing out the restrictive work done by the mutual manipulability criterion proposed by Kaplan (2012), Japyassú and Laland (2017) also pointed out cases ruled out of court by this criterion. Matched filters sensu Wehner (1987; see also Cheng & Freas, 2015) do not form extended cognition. Matched filters are simplifying devices to bypass or much reduce computational challenges. In cognitive systems, matched filters are peripheral systems specifically tuned to particular limited aspects of information in the sensory world. Such tricks do not solve the problem head-on with mathematically elegant solutions but provide roundabout approximations that work well enough most of the time in the range of problems that nature poses for the animal, natural selection presumably selecting for what works rather than mathematical elegance. A classic example given by Wehner and repeated by Japyassú and Laland is a parasitic wasp figuring out—metaphorically speaking, as it is doubtful that the wasp is figuring anything out at all in this case—the size of the insect egg that it is infesting with its own eggs. The physicist and mathematician’s elegant solution is to measure the curvature of the to-be-infested egg and then do some spherical geometry. The wasp instead determines how much it needs to extend a contrivance on its head called the scapus to plant it on the surface of the egg: the smaller the egg, the farther the scapus needs to move to get planted on the egg, and the greater the angle between scapus and head. Such sensory tricks might make up a large chunk of insect cognition, even in complex tasks such as navigation (Cheng & Freas, 2015; Wehner, 1987). Japyassú and Laland pointed out that although matched filters decidedly affect the animal’s cognition, the causal flow in the other direction is typically absent. With perhaps a few exceptions, the animal’s cognitive state does not affect the matched filter. This is especially true of anatomical features such as the distribution of foveal regions in vision. Sticking to the weaving theme, perhaps another illustration of extended cognition sensu Japyassú and Laland (2017) is displayed by nest-weaving ants of the genus Oecophylla (Hölldobler & Wilson, 1977, 1983; Wilson & Hölldobler, 1980; see also Bochynek & Robson, 2014), which have already appeared in the section on distributed cognition. Oecophylla represents one pinnacle of social evolution, with colonies of hundreds of thousands, complex division of labor, and multiple nests in trees, the construction of which may represent a case of extended cognition. It is a theme well worth exploring. In constructing a nest, weaver ants work as a team to pull the leaf into shape, bending the foliage as a chain of ants holding on to the edges tugs (Bochynek & Robson, 2014; Hölldobler & Wilson, 1977, 1983). Then workers need to glue appropriate edges together, and this glueing process may exhibit extended cognition. Larvae that secrete sticky substances to spin silk are used as glue sticks. The ideal silk-dispensing larva to be chosen is not too old (by which stage the larva is ready to spin a cocoon for itself) and not too young (at which stage it does not produce as much silk). The glue stick must be held in a particular fashion, and Hölldobler and Wilson (1983) conjectured that the larva must be tapped in a particular way to induce it to secrete the glue. The implication, not yet supported by evidence, is that the worker communicates to the larva some signal that results in the larva’s secreting glue. Then the worker holds the silk-secreting larva for so long at the starting edge, takes her across to the other edge, and holds the glue stick there for another, shorter duration. Although detailed studies of this glueing behavior have not been conducted, I conjecture that causal flow in both directions takes place, satisfying Kaplan’s (2012) mutual manipulability criterion. The worker would likely adjust her behavior depending on the larva, which is after all a live animal that varies one from the other. In the larva-worker causal direction, it is crucial that some form of communication takes place between worker and larva. That is, taking one of the criteria in the definition of a signal offered by Maynard Smith and Harper (2003), some aspects of the behavior of the worker affect the behavior of the larva, another organism. In this way, adjustments of the worker’s tapping are causally dependent on the behavior of the larva. In the other causal direction, the worker’s cognitive state in turn likely affects how she uses her glue stick, including how long to hold the larva in one place, where to take the silk secreter next, and when to declare the job done and take the larva back to her abode in the colony. Those who have worked with and observed weaver ants have seen flexibility in building nests. 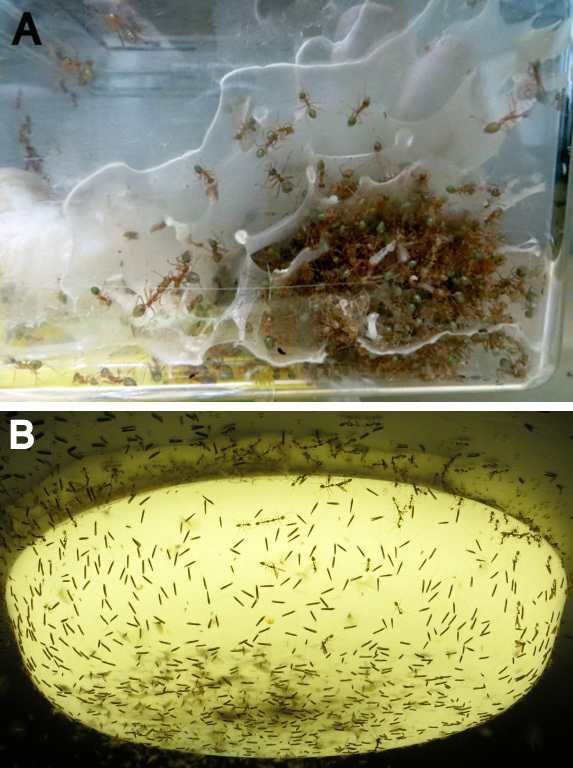 Oecophylla smaragdina, for example, has been observed in lab conditions to build nests in a plastic tub or around a light (J. F. Kamhi, personal communication, February 2017; Figure 3). The nest around the light attracts a good number of insect prey, some of which can be discerned in Figure 3B and many of which are voraciously attacked by the weaver ants. This might provide the functional reason for this unusual behavior. Figure 3. Nests woven by weaver ants (Oecophylla smaragdina) in unusual circumstances: (A) Inside a plastic tub. (B) Around an outdoor light. Nests around the light were observed to attract many insect prey, which the weaver ants attacked. Photos by J. Frances Kamhi. The cases of situated cognition featured so far have been conservative. It is time for one liberal case inspired by the domestic dog. Dogs display a panoply of what can be considered intelligent behavior (Miklósi & Kubinyi, 2016; Reid, 2009) and have specialized in evolutionary and recent history in “inveigling” (to reuse Wynne’s, 2016, memorable word) another more powerful and more intelligent species to do much with it and for it. In Merritt’s (2015a) enactivist view, “dogs almost always think with us” (p. 824, emphasis in the original). Merritt’s enactivist argument is that for both humans and dogs, many acts of intelligence do not fit neatly into the Cartesian mode of deliberate manipulations of and operations on representations. Merritt (2015b) put improvised dancing on center stage as a display of intelligence that is difficult to fit into the Cartesian mode. The moves of improvisational dancers are decidedly nonrandom, recognizable as dance rather than flailing about, and yet the intelligence so displayed is hardly deliberative but comes across on the fly. In her radical enactivism, the thinking is in the moving, leading to the catchphrase in the title “Thinking-is-Moving” (Merritt, 2015b, p. 95, emphasis in the original). In the case in which more than one dancer improvises onstage, the on-the-fly intelligence includes extended social cognition, on-the-fly reactions to the movements of others, a form of making sense together that has been called participatory sense-making (De Jaegher & Di Paolo, 2007). Intelligence comes out of movements of partners on the fly, in loose cahoots with one another. Merritt’s position is that such enactive intelligence on the fly must be added to—although not replace—the standard Cartesian mode in the full repertoire of cognition. When it comes to the dog, Merritt (2015a) gave a number of examples of intelligence that does not fit the Cartesian mode. Some of it concerns emotional reactions. The coevolutionary history of Canis familiaris and Homo sapiens has surely forged some mechanisms of bonding between the two species. Indeed, a recent study has found that mutual gazing releases a “positive loop” of increased oxytocin levels in both dog owner and dog (Nagasawa et al., 2015; the quoted term from their title). This oxytocin–gaze link has presumably been borrowed (exapted) from such a loop in mother–infant bonding in mammals, and in the words of the authors, “supported the coevolution of human-dog bonding by engaging common modes of communicating social attachment” (Nagasawa et al., 2015, p. 333). Dogs have been trained to keep still inside of functional Magnetic Resonance Imaging devices (Berns & Cook, 2016; Thompkins, Deshpande, Waggoner, & Katz, 2016). The noninvasive neural measuring technique has revealed other reward pathways tuned to human voices and smells (Berns & Cook, 2016; Thompkins et al., 2016). The exploits of the Border Collie named Chaser (www.chaserthebordercollie.com) was also featured by Merritt (2015a), as perhaps a case of understanding human linguistic expressions to an extent. Under a dedicated formal educational regime of operant training proffered by Pilley (Pilley, 2013; Pilley & Reid, 2011), Chaser learned to do various things (such as pick up in the mouth or poke with the nose) to more than 1,000 toys upon verbal command (e.g., take Lamb). Although Chaser’s cognitive achievements look standard, a liberal extended-mind theorist could suggest that the social achievement of operant psychology forms part and parcel of extended social cognition (Gallagher, 2013) in this case. But the most emblematic case raised by Merritt (2015a), although not discussed in depth, is that of wild justice (Bekoff, 2004, 2014; Bekoff & Pierce, 2009; Pierce & Bekoff, 2012; lay summary: Cheng, 2016, Chapter 16) displayed in canid play, because play in dogs parallels improvised dancing the most of all the cases just mentioned. Canid play is characterized by unstereotyped, freewheeling behavior, with the lack of stereotypy being one of the defining characteristics formulated by Burghardt (2015). Amidst the freewheeling, Bekoff (1977, 1995; Bekoff & Pierce, 2009) identified one highly stereotyped signal typically displayed during play: the play bow. The front legs are bent, the dog lowers the head near the ground, and the rear end is held up in the play bow. The play bow is more likely to be displayed after playfully aggressive incidents, and it is displayed more by canids that play more aggressively (infant coyotes); Bekoff (1995) suggested that the function of the play bow is to keep the social interaction going. To Bekoff and Pierce (2009), play bows and other unwritten and unrefereed rules of fair play function to maintain canid wild justice, the term “wild” signifying that this brand of morality is not codified formally and is specific to each social species that exhibits wild justice. Apes, for example, would have a different brand of wild justice. Ensuring fair play might in turn serve to make sure that the fair player has interactants to play with. Based on studies on wild coyotes, Bekoff (2014) suggested that unfair players are more likely to get excluded, and those excluded from play survive less well. The to-and-fro and give-and-take of canid play best exemplifies that thinking-is-moving enactive cognition in action that Merritt (2015b) championed. Ongoing play has rules of its own that need to be obeyed on the run (Bekoff & Pierce, 2009). Another of Burghardt’s (2015) definitions of play is that play must not cross the line into veridicality. Play aggression is no longer play when it turns into real aggression. Other on-the-line improvisations are called for in occasional role reversals (Bekoff & Pierce, 2009). For example, the normally dominant dog might display a submissive role in a segment of play. Indeed, canid play bears flavors of improvised dance. The flavor of improvised dance emanates perhaps even more strongly in human–dog play, fitting the thinking-with-humans theme raised by Merritt (2015a). Humans improvise and create variations on a theme in play with their canine companions, especially familiar ones (Mitchell, 2015; Mitchell & Thompson, 1990, 1991). Mitchell and Thompson called a run of theme and variations of a repetitive sequence of actions a project. Throwing a ball for the dog to chase is a common human activity in playing with canine partners. But the project of throwing the ball could be readily turned into fake-out, actions on the part of the human of pretending to throw the ball in order to get the dog to move in the anticipated direction of the throw. A familiar dog might in turn concoct the compatible project of avoid fake-out, in which the idea is to react as little as possible to fake throws and run after the ball only when it is really thrown. The link to the improvised dancing of a dyad and Merritt’s (2015b) enactivism could be rendered palpable if I play variations-on-a-theme with a line that Mitchell (2015) wrote in characterizing creativity in Homo-Canis play. The intelligence of the dancers arises as part of a collaborative dyad in which each dancer tries to gain and retain expertise in her routines within the accepted constraints of the improvisation. Mitchell actually described human–dog players as “part of a collaborative dyad in which each player tries to gain and retain expertise in his projects within the accepted constraints of the game” (p. 33). Mitchell does not write of enactivism, but Merritt could have drawn such a parallel and emphasized human–dog play more in her enactivism. The parallels between human–dog play and dancing should not be taken too far. It can be argued that dancing is art, whereas human–dog play is not. The issue is complex, and a stand on that front is not needed for the current discussion. For recent thoughts on the matter, see Noë (2017b) and discussion (Carroll, 2017; Eaton, 2017; Guyer, 2017; Hyman, 2017; Noë, 2017a). These cases of enactivism, both improvised dancing and human–dog play, might also fit the confines of extended cognition according to the mutual manipulability criterion. It is likely that each of the two dancing or playing parties is causally influencing the cognition of the other party. How much of cooperative communication satisfies the mutual manipulability criterion remains to be explored. Whereas Merritt (2015a, 2015b) contrasted enactive on-the-run actions as a different brand of cognition from the standard Cartesian representational brand, the two brands make a merger in some cognitive enterprises, such as in the Cartesian stronghold of navigation. This case is best made for insect navigation, a much studied domain in which a large chunk of research has been conducted in the field, the actual habitats in which wild insects navigate. Although much of the work on insect navigation concerns the nature of what is encoded to do the job of navigating home or finding a food site (reviews: Cheng, 2012; Cheng & Graham, 2013; Collett, Chittka, & Collett, 2013; Webb & Wystrach, 2016; Zeil, 2012), a small corpus has examined how the ant moves to look at her environment, in learning about it, or in using it to navigate. Would-be foraging ants take learning walks around their nest before setting off on food-searching excursions (North African desert ants: Fleischmann, Christian, Müller, Rössler, & Wehner, 2016; Fleischmann, Grob, Wehner, & Rössler, 2017; Wehner, Meier, & Zollikofer, 2004; South African desert ants: M. Müller & Wehner, 2010; Australian desert ants: Muser, Sommer, Wolf, & Wehner, 2005). Well-choreographed preforaging learning routines have also been demonstrated in flying hymenopterans, honeybees (Degen et al., 2016) and in detail in wasps (Stürzl, Zeil, Boeddekker, & Hemmi, 2016; Zeil, 1993a, 1993b). Recent work provides evidence that the ants’ (the North African Cataglyphis fortis) orchestrated walks lead them to learn about the surrounding scene (Fleischmann et al., 2016). Turning on the spot and looking are behaviors commonly reported in the literature on the tests done in the field on ants; the ants often turn and look before setting off in a definitive direction. Most of the literature, including studies from my group, gives short shrift to such pretravel movements because we have been focused on more Cartesian aspects of cognition as revealed, for example, in the initial heading direction. But in two Australian ants, such looking behavior has been examined in some detail: in the bull ant Myrmecia croslandi (Zeil, Narendra, & Stürzl, 2014) and the desert ant Melophorus bagoti (Wystrach, Philippides, Aurejac, Cheng, & Graham, 2014). Such head and body saccades, as Zeil et al. (2014) and Wystrach et al. (2014) called them, are not random, but choreographed movements. The language of dance proved irresistible in describing the learning walks of the South African Ocymyrmex robustior: M. Müller and Wehner (2010) used the term “pirouette” in quotes. The quotes were absent in Fleischmann et al.’s (2017) terminology. These authors described pirouettes, which are saccadic turning movements with stopping points, and voltes, which are tight turns without stopping points, in the learning walks of three Cataglyphis species. Although terms connected with dancing are used to describe ants’ scanning movements, differences between such scanning behavior and improvised dancing should be noted. Ants’ scanning is a stereotyped behavior that contrasts with the variable and creative nature of improvised dancing. Scanning is also thought to have a survival function: to learn the scenery in learning walks and to refamiliarize the well-traveled navigator with the scene after some gap of time. Wystrach et al. (2014) documented that the navigating M. bagoti was more likely to scan on the first trip of the day. These latter authors also think that systematic scanning is a reaction to uncertainty in general, as the ant also scans more when wily experimenters have conjured up an unusual change in the scenery in the name of research. Such a turn–look–find-the-way routine has been recently chronicled in a clever study on another uncommon navigational behavior in ants—but one observed occasionally by most researchers watching navigating ants in the field—walking backward (Schwarz, Mangan, Zeil, Webb, & Wystrach, 2017). Unlike wasps, whose saccades pirouette with side-sweeping arcs of controlled flight (Stürzl et al., 2016), ants cannot walk sideways. But they do walk backward when they luck out on the bonanza of a big chunk of edible morsel. The size of the booty requires them to drag it while stepping backward. Schwarz et al. (2017) tantalized desert ants in Spain, Cataglyphis velox, with large chunks of cookies to induce backward walking. With unsteady gait facing away from the goal direction, in which the scene looks different, this presents a navigational challenge. Does the desert ant somehow rotate the scene in its head, a piece of challenging but standard cognition, to figure out and keep to the correct direction to walk in? Nothing of the sort, so the research revealed (Schwarz et al., 2017). Instead, the backward-walking ant keeps walking in the general direction it has been walking, with some meandering from the exertion of dragging her large booty. Occasionally, the backpedaler drops her cookie briefly, then turns around and looks at the environment. It is at such moments that course correction takes place. The ant often adjusts her course in dragging her booty backward after such scans. Schwarz et al. concocted a winding track home for the ants using low walls that did not block the ants’ view of the surrounding scene. Course adjustments postscanning became obvious if the scan took place after the ant entered a bend in the course home. The backward-walking direction is referenced with respect to celestial compass cues, forging a newly discovered link between celestial and terrestrial cues, but such details are not needed for the current account. Such choreographed pirouetting movements and looking, in Schwarz et al.’s (2017) Spanish desert ants, in Wystrach et al.’s (2014) Australian desert ants, and in Zeil et al.’s (2014) Australian jackjumper bull ants, all link up with the standard Cartesian mode of operation in visual navigation. Whereas view-based navigation in ants is still being worked out, the going view is that the ant represents some palette of features in the surrounding scene, such as the skyline (Graham & Cheng, 2009), or the fraction of the scene that is to the left (or right) of the goal direction (Lent, Graham, & Collett, 2013), and then moves in the direction that best matches remembered characteristics (Möller, 2012; Wystrach, Beugnon, & Cheng, 2012) or that looks familiar (Baddeley, Graham, Husbands, & Philippides, 2012), all standard cognitive accounts. It is possible that the pirouetting and scanning ant has not figured out or computed (to use a more formal standard cognitive term) the direction of travel; otherwise it would turn once, the extent of pivot computed by central cognition, and then move in that direction. Instead, the pirouetting functions in, and is necessary for, arriving at the correct direction in which to travel. The choreographed dance of navigating ants supports the Cartesian cognition of wayfinding, and is in fact necessary for it. If we accept the link between pirouetting and standard accounts of wayfinding in ants, then the pirouettes fit the bill for extended cognition sensu Kaplan (2012) and Japyassú and Laland (2017), with actions extending cognition rather than physical objects. The mutual manipulability criterion is satisfied. Accepting the previous paragraph, the pirouetting is in the causal loop for the ant’s setting off on a direction of travel. It affects the (standard) cognition of the navigating ant. The ant might change its direction of travel after scanning, as Schwarz et al. (2017) clearly demonstrated. In the other causal direction, the (standard) cognitive state of the ant affects the ant’s pirouetting. Thus, the standard cognitive state of uncertainty, in the guise of the first trip of the day or a change in the usual scenery, at least increases the amount of pirouetting, as Wystrach et al. (2014) documented. The current data are pointing to both sides of the mutual manipulability criterion. In general, information-seeking behavior that supports a cognitive enterprise often satisfies the mutual manipulability criterion. Kaplan (2012) gave the example of saccadic eye movements in humans to look repeatedly at a target to support working memory. To satisfy the mutual manipulability criterion, certain cognitive states must cause more or different kinds of information seeking, and the information seeking must help the enterprise. Examples might include rats looking down an arm of a radial maze before entering the arm, a behavior that has been called a microchoice (Brown, 1992), and various primates looking when they are uncertain as to the location of hidden food (Beran, 2015; Hampton, Zivin, & Murray, 2004; Marsh & MacDonald, 2012). In primates, the causal link in both directions are well established. Looking helps them locate the reward, and they look more under some cognitive conditions, those of uncertainty. Whether such information seeking means metacognition on the part of the animals is argued (Beran, 2015; Crystal & Foote, 2011), but for the mutual manipulability criterion, it does not matter whether knowledge of their own cognitive states (metacognition) or some rules based on associative learning are driving the behavior. The bidirectional causal links are present in either case. Situated cognition has been bantered in philosophy and cognitive science for some time now (Michaelian & Sutton, 2013). Its connection with nonhuman animals has a more recent history, as indicated by the dates of the key literature cited in this article. Criticism of situated cognition also continues apace (Adams & Aizawa, 2001, 2010; Goldinger, Papesh, Barnhart, Hansen, & Hout, 2016). Goldinger et al. (2016) aimed their many darts at embodied cognition, but they could have expanded the attack to extended and enactive cognition as well. The basic argument is that many kinds of phenomena in cognitive psychology do not take on any embodied explanation and in fact need standard representational theories and models to explain. The phenomena that they unpacked in some detail include word frequency effects and face perception. One of those phenomena has comparative roots: stimulus generalization. The authors argued that it is hard to see how accounts of such phenomena can escape references to representations. Indeed, similar arguments could be made about various phenomena currently studied in comparative cognition, such as transitive inference, spatial search in an arena, or classical conditioning. It seems impossible to eschew entirely talk of the nature of what is encoded in the brain, of central cognition, in accounting for these phenomena. Ziemke (2016) accused Goldinger et al. of misunderstanding and misconceiving embodied cognition but, unfairly, did not indicate in what way. While admitting a role, perhaps a central role, for standard cognition, other forms of cognition may well be fruitfully added in comparative cognition. The conservative stripe of situated cognition is worth exploring, to provide interesting research leads. Each of the three e-words, embodied, extended, and enactive, emphasizes a different supporting actor to complement the lead star of standard cognition, respectively, the peripheral nervous system, objects, and actions. The embodied cognition of cephalopods takes on a different flavor from the embodied cognition envisaged for humans. In the former case, it means neural and cognitive processing, of the standard brand, outside of the central brain. In the latter case, it generally refers to contributions to cognition from processing motoric and bodily information, still in the central brain. In the comparative context then, the taxa to look for embodied cognition would be ones with little or no central, cephalized groups of neurons known as a brain. Assuming that it requires a nervous system to exhibit cognition (see Godfrey-Smith, 2016, for a discussion), the phyla characterized by nerve nets come to mind, namely, Cnidaria and Ctenophores. Neither of these taxa have been much studied, as cognitive research and zoological research in general has concentrated on bilaterian animals. Cnidaria encompass jellyfish, hydra, and anemones. They exhibit movements such as escape behavior and possess sense organs, suggesting some minimal cognition. And indeed, various forms of learning are found in Cnidaria: classical conditioning in sea anemone (Haralson, Groff, & Haralson, 1975) and habituation (in hydra: Rushforth, Burnett, & Maynard, 1963; Rushforth, Krohn, & Brown, 1964; in sea anemone: Logan, 1975; Logan & Beck, 1978; in jellyfish: Johnson & Wuensch, 1994). Sea anemones fight (Ayre & Grosberg, 1995, 1996), engaging in what has been called trench warfare (Knowlton, 1996). Jellyfish show a range of behavioral servomechanisms and are said to have a mind (Albert, 2011). Cnidaria possess a distributed nerve net, with some hydra species having a ring of neurons at the head end (Koizumi, 2007); they lack a centralized brain. The neuroanatomy suggests that embodied cognition might well rule the day. Ctenophores encompass comb jellies, not to be confused with jellyfish, which are Cnidaria. They are known for the rows of cilia known as combs (Tamm, 2014). With a distributed nervous system, they move and hunt for food (Dunn, Leys, & Haddock, 2015; Tamm, 2014). Ctenophores are of interest because a number of molecular analyses suggest that they are the outgroup when it comes to animal evolution (Halanych, 2015; Moroz, 2015; Moroz & Kohn, 2016; Ryan, 2014; Ryan et al., 2013; Whelan, Kocot, Moroz, & Halanych, 2015), although this phylogenetic placement is disputed (Moroz & Halanych, 2016; Telford, 2016). Moroz (2015) wrote of the Ctenophores’ independent evolution of a nervous system. Much about their nervous system is known (Tamm, 2014), but their learning and cognition are open vistas. Beside another angle on embodied cognition, studying them can shed new light on the evolution of cognition. Extended cognition sensu Kaplan (2012) and Japyassú and Laland (2017) offers opportunities for research to figure out whether some extended phenomena constitute a part of cognition. Putting a definite empirical stamp on the issue was one of the desiderata championed by Kaplan (2012) in formulating the mutual manipulability criterion. Sorting out causal directions of phenomena requires empirical research beyond pure philosophy and gedanken-experiments. Kaplan (2012) called it laying down a clear gauntlet (p. 567), but I would rather put it as an invitation embossed in gold to do interesting empirical research. I have already discussed one relevant phenomenon in the weaving behaviors of weaver ants. Many animals manipulate objects. No doubt, readers could come up with other cases in need of research. This call echoes Japyassú and Laland’s (2017) concluding words, that “increasing attention to the possibility of extended cognition may open up exciting new opportunities for novel research” (p. 389). Enactive cognition emphasizes action in cognition. Actions are key ingredients of play, and I have made the suggestion that actions that are far from cognitive in flavor—the choreographed pirouettes of ants—may be a key ingredient in navigation. I flag a new theme of research for comparative cognition and neuroethology: noncognitive actions playing a causal role in cognitive feats and satisfying the mutual manipulability criterion. Navigation may well be deeply intertwined with action, as the whole point of navigation is to move somewhere, not just think of space. In the past, I have cast much of navigation as servomechanisms (Cheng, 1995), and I still think this a good characterization of most navigational feats (Figure 4). A servomechanism has components of both representation and action. The representational component, the comparator, compares readings of variables with settings of what that variable should be. The discrepancy, the error, drives action—which, if the system is working well, reduces the error. In depicting this action–representation loop, I have typically emphasized the box doing the representational work: The box containing the cogitive activities of the central brain was much larger in the figures in Cheng (1995). If talk of enactive cognition tilts the navigation researchers and the entire field of comparative cognition to pay more attention to action, that would be an advance. It is time that we paid more attention to the scribbling and bibbling. Figure 4. Depiction of a servomechanism then and now. In a servomechanism, action is generated that feeds back on the central nervous system that in turn adjusts the action. (A) The proportions of various components of the servomechanism as depicted in figures in Cheng (1995). Processes taking place in the brain dominate, with the area of the box containing brain processes 11 times the area of the box for action generation, which itself is still a brain process. Actions are depicted only on the link to the brain processes. 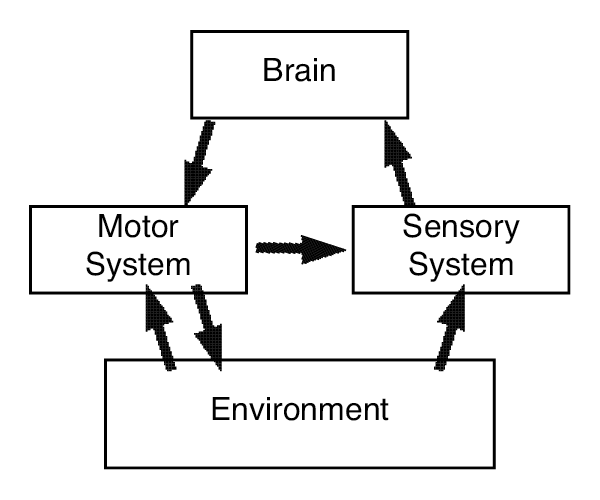 (B) A current depiction showing brain processes, action, and feedback from sensorimotor processes in a continuous loop with approximately equal emphasis on each. In short, consideration of matters of situated cognition, beyond sustaining interesting philosophical discussion, promotes research themes for comparative cognition and for neuroethology as well. The mutual manipulability criterion should excite the field in promising new vistas of research, a new toy akin to a versatile submersible for plumbing the depths of cognition. Scientists of cognition, dive in. Cheng, K. (2016). How animals think and feel. Santa Barbara, CA: ABC-CLIO. Descartes, R. (1985). The philosopical writings of Descartes (Vol. 1; J. Cottingham, R. Stoothoff, & D. Murdoch, Trans.). Cambridge, England: Cambridge University Press. Descartes, R. (1991). The philosophical writings of Descartes (Vol. 3; J. Cottingham, R. Stoothoff, D. Murdoch, & A. Kenny, Trans.). Cambridge, England: Cambridge University Press. Hölldobler, B., & Wilson, E. O. (1983). The evolution of communal nest-weaving in ants: Steps that may have led to a complicated form of cooperation in weaver ants can be inferred from less advanced behavior in other species. American Scientist, 71, 490–499. Maynard Smith, J., & Harper, D. (2003). Animal signals. Oxford, England: Oxford University Press. Mitchell, R. W., & Thompson, N. S. (1991). Projects, routines, and enticements in dog-human play. In P. P. G. Bateson & P. H. Klopfer (Eds. ), Perspectives in ethology (Vol. 9, pp. 189–216). New York, NY: Plenum Press. Zaentz, S. (Producer), & Forman, M. (Director). (1984). Amadeus [Motion picture]. United States: Orion Pictures.